It had been so long since I last visited Great Barton that I really did not remember the village at all. It is a large place, a bit of Bury St Edmunds broken off really, only the railway line separating it from the Moreton Hall Estate. The church sits a good half mile from the village, down a narrow dusty lane. A large hare sat on the road in front of me as I left the village, and loped along just ahead in no particular hurry until we reached the church gates, where he turned and looked at me, and then preceded me into the graveyard. It was hard not to imagine that he was an omen of some kind. Holy Innocents is one of those spectacular 15th Century rebuilds that East Anglia did so well, and is all the more so for being so remote. Mortlock calls it 'handsome', which is about right. The big tower rides high above the clerestory and aisles, the long, earlier chancel extending beyond. It has much in common with Rougham, just across the A14. Windows to aisle and clerestory create something of the wall of glass effect so beloved of the later Middle Ages. Unusually, there is a tomb recess in the outside of the south wall of the chancel which was possibly for the donor of the chancel. The 15th Century south porch carries a later sun dial with the inscription periunt et imputantor, which means something like 'they perish and are judged'. You step inside to a big church. Despite the windows of the south aisle being filled with coloured glass, the church is full of airy light and space. This is accentuated by the hugeness of the chancel arch, which goes with the 13th Century chancel - that is to say, nave and aisles were built to scale with it as a starting point. In such a great space the furnishings do not intrude, and they are pretty much all the work of the 19th Century restoration here. They are a good counterpoint to the spectacular glass of the south aisle. 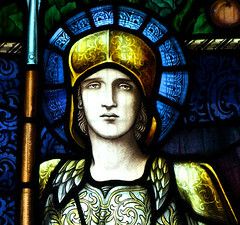 The first window is by the William Morris workshop, with the figures by Edward Burne-Jones of Faith Hope and Charity. All three are shown, unusually, as men. Faith is the Roman centurion at the foot of the cross, Hope is Joshua and Charity is the Good Samaritan. Beside it is a window which is somewhat bizarre. A number of Suffolk churches have windows to commemorate the Golden Jubilee of Queen Victoria in 1887, but none, I think, are quite like this one. The stately queen sits with a look of indigestion upon her face among angels carrying her crown and the Bible. She is flanked by two rather unlikely fellow monarchs, the Queen of Sheba with a snake of temptation and her motto Wisdom is better than rubies and a positively louche Queen Esther with If I perish, I perish. Above Victoria's head in a scroll is inscribed In her tongue is the Law of Kindness from the Book of Proverbs. All in all, a remarkable piece. Ther other window in the aisle depicts the Ascension flanked by the Nativity and the Resurrection. The Nativity scene is particularly good. It is unsigned, but I wondered if it was by AK Nicholson. But for the oddest window of all, you have to step up into the chancel. Here, on the south side, is another depiction of the Resurrection and the Ascension. These appear in the upper part, and in the lower part are the Disciples watching the Ascension and the Roman soldiers asleep at the Resurrection. However, these lower parts have been put under the wrong upper parts, and the sleeping soldiers are missing the Ascension and the Disciples are watching the Resurrection! Such a blunder can only have happened in the studio, when the cartoons were being laid out before the glass was made. Holy Innocents is an interesting dedication, and an unusual one for an Anglican church, especially a medieval one. Bear in mind that, in the Middle Ages, churches were dedicated to feast days, especially of Saints, and not the Saints themselves. Holy Innocents is celebrated on December 28th, and remembers Herod's massacre of the babies of Bethlehem. It would have been a more common dedication in medieval times. Here, it is probably a relic of Anglo-catholic days, and the 19th century revival of church dedications; but it may also be the original dedication of the church. It is quite clear that this church enjoys a High Church character this day, and is one of the few village churches in the Bury area where you can light a candle when you say a prayer. Like all good High Church parishes, Great Barton keeps Holy Innocents open every day, and there is even a Fair Trade shop where you can make your purchases and perform a work of mercy at the same time, a fine opportunity. 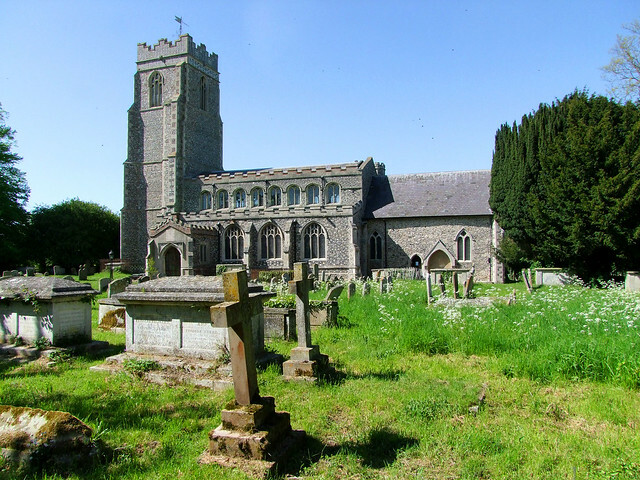 Back outside, the churchyard is one of the best in Suffolk to potter about in. It is vast, with a good 300 years-worth of headstones. While exploring, you might notice that the very north-east corner of the churchyard is cordoned off by a low brick wall, and contains but a small number of graves. They are to the Bunbury family, who are also remembered with mural monuments in the chancel of the church. The Bunburys had lived at Barton Hall, but it was destroyed by fire in 1914. Sir Henry Bunbury achieved a place in popular history in the early 19th century when he was the foreign office official who had the job of breaking the news to Napoleon that he was to be exiled to St Helena. The school history books that speak of the defeat of Napoleon have long since been consigned to the skips. Now, all that remains is the light summer breeze in the corner of a Suffolk churchyard.